Joonas Suotamo as Chewbacca and Alden Eherenreich as Han Solo in Solo: A Star Wars Story. 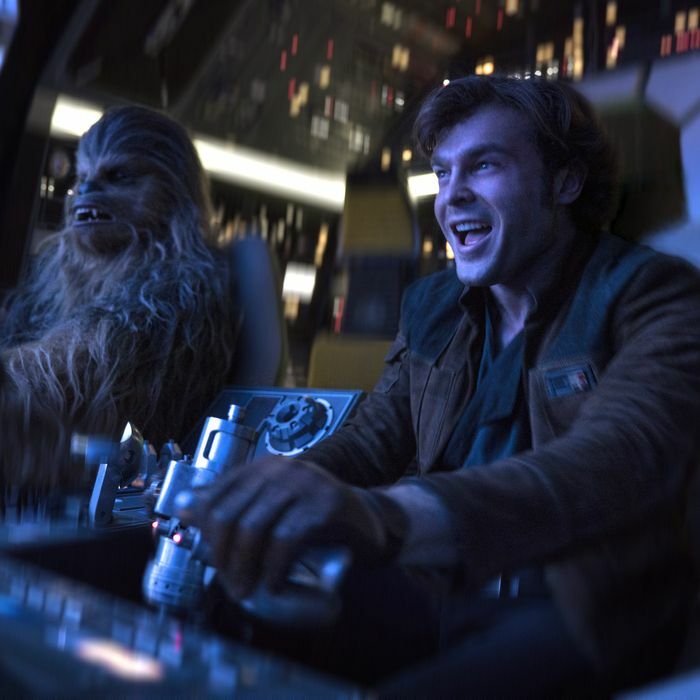 Weeks away from its May 25 release and still sight unseen, it’s fair to say that Solo: A Star Wars Story already arrives as one of the more problem-plagued big-budget movies in recent memory. In June, after completing at least three-quarters of principal photography on the stand-alone prequel — which traces the early, pre–Mos Eisley adventures of Harrison Ford’s iconic space-smuggler character Han Solo — original co-directors Phil Lord and Chris Miller were fired by Lucasfilm studio boss Kathleen Kennedy over “creative differences.” Days later, Ron Howard was hired to finish the film. Rumors ricocheted around Hollywood that the script was “unworkable” and that star Alden Ehrenreich was struggling to nail his impersonation of Ford, compelling some fans to preemptively revolt. Vulture’s source, who declined to be identified because he is not authorized to publicly discuss the movie at this time, felt Lord and Miller were out of their depth, more cut out for light comedy — like The Lego Movie and 2012’s big-screen adaptation of 21 Jump Street, the movies for which the pair earned their reputation for delivering surprise hits — than the kind of big-budget, galaxy-questing action that Lucasfilm required. Howard certainly needs to work fast. According to our insider, the director reshot a majority of Solo at London’s Pinewood Studios, and is now in post-production on the Disney studio lot in Burbank. Howard has been cagey about the “How much is his and how much is theirs?” aspect of the film that has stoked fan fascination. “[Of] course Phil and Chris’s fingerprints are all over the movie, given how much they put into it and the time they put into it,” he recently told EW.